This custom profile is 18 x 144mm wide with a secret fix giving a 125mm cover. 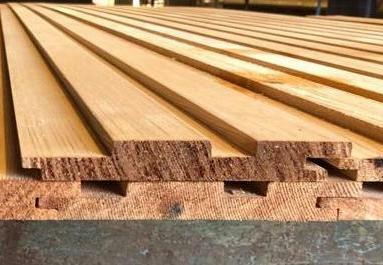 We milled this in Grade 2 clear Canadian Western red Cedar. The profile can be used on its own to give a ribbed affect. The upstanding ribs are 42.5mm wide and the shadow gap is 20mm. The customer chose in this instance to combine this with our 100mm cover and 125mm cover standard channel profiled (modified to give a 20mm shadow gap). The combination of the three profiles can be used to break up the look of large expanses of wall. local areas can be clad using the same profile which can be used to great effect to define areas of the building.